Nature's way is a diversified beverage contract manufacturer located in Northeastern Pennsylvania. Founded in 1996, Nature's Way initially began serving their peerless water just to the local community. Buoyed by an overwhelming market response they then constructed a high speed mass production facility to allow distribution on a national scale. The official winner of our “From Drab….to Fab Office Makeover Contest” meeting all of the requirements was Nature’s Way. Nature's Way is a diversified beverage contract manufacturer located in Northeastern Pennsylvania. Founded in 1996, Nature's Way initially began serving their peerless water just to the local community. Buoyed by an overwhelming market response they then constructed a high speed mass production facility to allow distribution on a national scale. The official winner of the 10,000th Order Contest meeting all of the requirements and the recipient of a $1,000.00 Credit Memo from 4 The Office was Just Cabinets. Just Cabinets Furniture & More is a home furnishings retailer in the Mid-Atlantic region with an unparalleled selection of home furnishings and cabinetry. For over 30 years the company continues its mission of providing exceptional service, value, and selection. Retail locations can be found throughout Pennsylvania, Maryland, Delaware, and New Jersey. 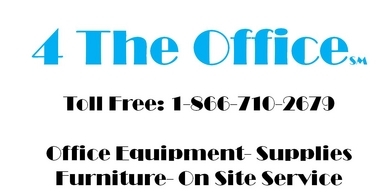 Our Proprietary Brand of Office Supplies is Business Source, and we are confident you will save money on office supplies. Additionally, many of our Business Source Products are Made in the USA. You can type in "BSN" in the search bar while shopping in our online store, let's get started.